Wear it proudly. 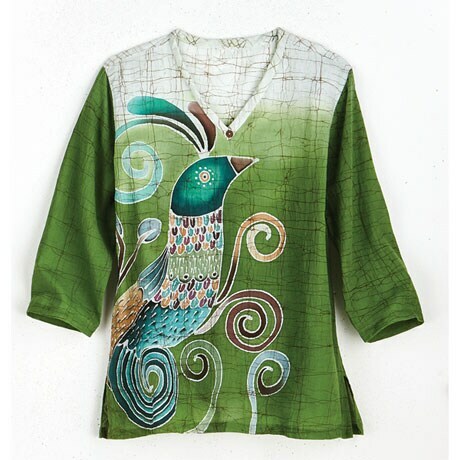 Handbatiked in Thailand in rich, vivid colors, 100% cotton tunic has a V-neck accented with a single coconut button, 3/4-length sleeves, yoke back, and 5" side vents. Sizes S(4-6), M(8-10), L(12-14), XL(16-18). Hangs 27". Hand wash. A Fair Trade item from Novica in association with National Geographic, empowering artisans around the world to succeed.